Mercedes' Lewis Hamilton continued his imperious form at the Chinese Grand Prix by setting fastest time in final practice before qualifying. The world champion was 0.226 seconds clear of team-mate Nico Rosberg while appearing to have plenty still in hand. Ferrari's Sebastian Vettel was third, 0.698secs behind, 0.199secs ahead of team-mate Kimi Raikkonen. Red Bull's of Daniel Ricciardo and Daniil Kvyat were next and Jenson Button 15th. It was a step backwards for Button's McLaren-Honda team, who ran in the top 10 for much of Friday for the first time in the season that marks Honda's return to Formula 1. Even worse, his team-mate Fernando Alonso ground to a halt just a couple of corners into his out lap with an engine failure. The Spaniard missed the entire session and it remains unclear whether the team will be able to fix the car in time for qualifying, for which McLaren have hopes of getting out of the first knock-out session for the first time this season. There were no such troubles for Hamilton, though, whose form matched the unfamiliarly resplendent clear blue skies above normally smoggy Shanghai. "This Formula 1 season is giving up its secrets slowly so far, but tantalising they are nonetheless. Lewis Hamilton has upped his game in 2015, it seems, but so too have Ferrari, and Friday in Shanghai hinted that the lessons of Malaysia two weeks ago may have some longevity. Meanwhile, Red Bull look back in the game after a couple of bad races, and how long will it be before McLaren-Honda are up there, too? Lots to look forward to - both this weekend and over the remaining 16 races." Hamilton, who topped both sessions on Friday, was 0.279secs clear of Rosberg on their earlier runs on the slower 'medium' tyre and at least as comfortable on the faster 'soft' that will be used for qualifying. Hamilton had appeared capable of extending that margin on the 'soft' to in the region of half a second or so, but he lost time in the final sector of his best lap, and then aborted another subsequent tour that looked as if it could have been quicker again. Ferrari are clearly best of the rest, but have some way to go to match Mercedes in qualifying trim, although they may well be closer on race pace. Red Bull have emerged as the third best team this weekend, after two disappointing races at the start of the season, but are troubled by recurring brake overheating. And their junior driver Carlos Sainz Jr continued to impress in the Toro Rosso, setting seventh fastest time. 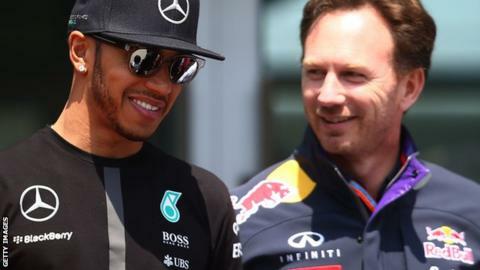 The Spaniard was split from much-vaunted 17-year-old team-mate Max Verstappen - who had a spin at Turn Eight - by Williams's Valtteri Bottas. Lotus's Romain Grosjean completed the top 10 ahead of the second Williams of Felipe Massa. Englishman Will Stevens beat team-mate Roberto Mehri in the private battle of the low-budget Manors at the back of the grid.